Every school year is different from the year before. 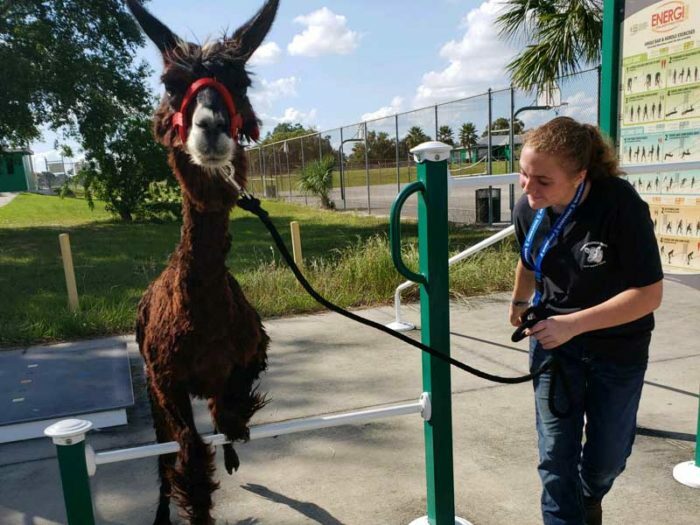 Changes to curriculum, new policies, upgraded facilities, new alpacas…..wait, what? That’s exactly what happened this year for FFA members in the Haines City Senior FFA Chapter. At the close of the 2017 – 2018 school year, the chapter received six alpacas to start off their alpaca herd. Today, the chapter now has eight alpacas, each with their own different personality. Reanna Brown, freshman in the EATA academy, shows “Sally,” a three year old female. Showing along Brown in the ring is Susy Cervantes, Devin Toler, Cherish Hutchinson, Nicole Forey, Isabella Rodriguez, and Julissa Colvarro. “It’s been a great learning experience!” shares Brown, who works with Sally every day during class and after school. Brown, who has a few years of showing cattle and zebus under her belt, shares in what ways showing alpacas differentiates from showing cattle. Such ways include; not holding the top of the leadrope closest to the halter, not “setting up” their feet, they tend to follow you easier than cattle do, and in alpaca shows, there are multiple classes, one of which is the “obstacle” class, where you walk your alpaca through a setup of various obstacles that they must complete. Aside from the team working with their alpacas everyday, they also attend workshops and seminars to expand their knowledge. So far, they have attended two workshops since late August. One covering different fleece, how to dye the fleece, and things to make with it. “I learned how to crochet using wool collected from the alpacas. I think I’m pretty great at it!” jokes Brown. The second workshop covered proper nutrition of the alpacas. “They tend to fight over their food and who gets to eat the most. The nutrition workshop offered great insight for multiple alpacas at feed time. Since changing up Sallys feed time, she’s gained more weight and is filling out much better,” says Brown. November 4 was a big day for the team as they headed to the Marion County Fair for their very first show. The next show scheduled for them is at the Florida State Fair, which is the largest alpaca show in the state and has a costume contest along with it! “Oh I’ve already begun planning our outfit! You wanna TACO ‘bout it?” Brown jokes. It’s always exciting seeing new things coming from local chapters and seeing students think outside of the box. Way to go Haines City! I for one am very excited to see what is in the future for the HCHS FFA Chapter and can’t wait to show my support as much as I can! That brings us to a close this month. As you’re diving in to pumpkin pie and scarfing down turkey around the table this Thanksgiving, make sure you add Farmers to your list of things to be thankful for!